Rumors have been surrounding BMW regarding a new sedan in the making that will be positioned below the BMW 3 Series. A series of hints of the new BMW 1 series have been there about the same in the past but no official statements from BMW officials ever came out, until now. Not so surprisingly the news is surfacing the internet once again and but this time around the news has been confirmed by BMW. We do not have any official pictures of the same but to believe in the car we have a really close rendering from Autocar.co.uk. So to an extent we are sure that the car is all set to be launched soon, but when? Reports state that BMW is planning to bring a 4-door sedan version of the BMW 1 Series in the United States in 2015. The same car will compete with Audi A3 coming in 2014 and Mercedes-Benz CLA launching next year. 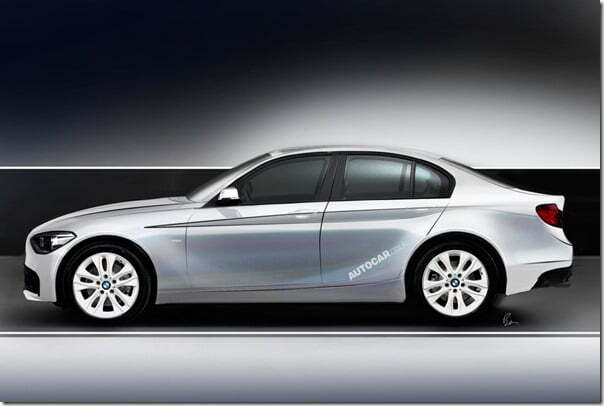 The upcoming 1 series sedan will be a four door sedan with a rear wheel drive configuration. The car will be a successor of the E30 generation 3 series and will feature the same engines as on the global hatchback and coupe models. The sole reason why BMW wishes to develop a small sedan is because of the F30 3 Series. Since the 3 series’ launch in 1975, it has grown approximately 1 foot in length, 2 inches in height and 8 inches in width. So gradually the 3 Series shape is transforming and it is getting bigger and bigger and therefore the company needs to have a compact offering. The base model of the car is going to be priced below Rs. 20 lakh while the top end model will be priced close to the BMW X1 and Audi Q3 base variants. When launched the car will not only compete with A3 and CLA but will also give cars like Volkswagen Passat, Skoda Superb and Honda Accord a run for their money.